Like T-64 and T-80, T-72 and T-90 MBTs employ an autoloader to arm their 2A46/M mainguns. However, their autoloaders are substantially different. First, the autoloader in T-72 is mechanical instead of hydraulic. 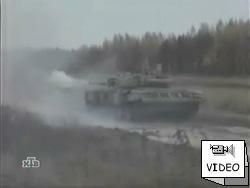 Second, the placement of propellant charges varies between the tanks of T-72 and T-80 line. While on a T-72 the charges are placed horizontally on top of the main rounds, T-80 has its charges placed vertically on the outside of the main rounds. The reason why T-80 inherits T-64's autoloader but T-72 doesn't is that T-72's hull is a bit narrower and T-64's autoloader wouldn't fit, so it was designed from scratch during T-72 development. Note however, that opposite to a common belief the carousel is well protected from above. During loading, the round passes through the door that closes after the tray has retracted, and therefore in the case of turret penetration the incandescent splinters will land on the autoloader roof and not ignite the carousel. Nevertheless, the extra rounds stored in the fighting compartment are very likely to ignite in this case, and of course the lower hull penetration is quite deadly. In other words, not the autoloader per se, but the whole notion of placing ammunition inside a fighting compartment makes the tank very susceptible to catastrophic fire if penetrated from virtually any angle. This has been amply illustrated by the conflicts in which T-72s and T-80s have participated. As a result, the current Russian desings move away from a 40-year-old autoloader model. Both the Black Eagle MBT and the new N.Tagil MBT have other types of autoloaders and different ammunition layouts, the former having a traditional Western turret bustle and the latter - so far unknown layout. 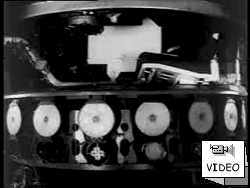 Upon a gunner's command, the gun is brought to the loading angle (+3° from horizontal), and the transporter starts to rotate, bringing the cassette with the desired type of round into the loading plane. The cassette then rises until its lower tier (main round) is in the ramming line. The loader then rams the round into the chamber of a gun fixed in a loading angle and then returns to its original position. The cassette lowers bringing the propellant charge to the ramming line, and it is rammed into the chamber in a second cycle. The cassette returns to its original position on a transporter, while the gun is automatically moved to the remembered engagement angle. After the shot the stub base is caught by the extraction mechanism and in the next loading cycle gets ejected out of the tank through the hatch in the rear of the turret. This page is © 1999-2005, Sauron's Creations.